EDMONTON – Northern Ontario scored deuces in the third and fifth ends but needed a single in the 11th for a 6-5 win over Brad Gushue of Newfoundland-Labrador that propelled the Brad Jacobs team into today’s semifinal at the Tim Hortons Brier, presented by Monsanto. Jacobs appeared in control of the game until the 10th when Gushue buried an early stone behind cover and Northern Ontario could never get it out. On his final shot, trying to come through a narrow port, Jacobs wrecked on the guards when distracted by a light in the stands. That gave Gushue a steal to force the extra end, where Gushue’s team failed to get an early guard attempt across the hog-line, leaving Jacobs to draw the four-foot for the win. In winning the Page three-four game, the Jacobs foursome, with third Ryan Fry, second E.J. 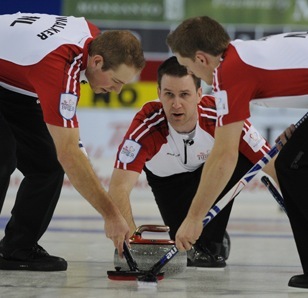 Harnden, lead Ryan Harnden, alternate Matt Dumontelle and coach Tom Coulterman, now plays defending champion Glenn Howard of Ontario in the semifinal Sunday at 8:30 a.m. MST (TSN-RDS). 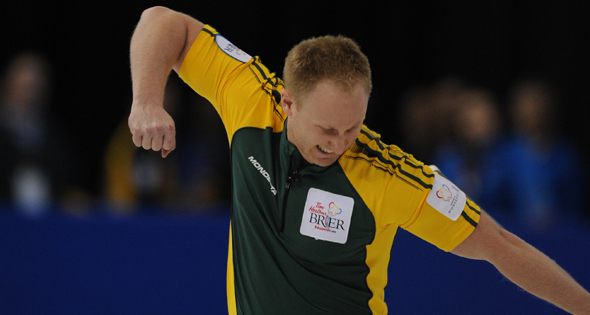 The winner of that game will meet Jeff Stoughton of Manitoba in the final at 6:30 p.m. (TSN-RDS). Stoughton beat Howard earlier in the Page one-two game. The semifinal loser will play Gushue for the bronze medal 1:30 p.m. Sunday. That game will be available on TSN.ca. 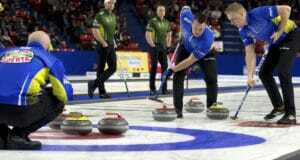 Newfoundland-Labrador struck first with a single in the second on a last-rock draw by Gushue. But Northern Ontario responded with a pair in the third. After three great draws around cover left a Gushue counter on the button, Jacobs went to the hit and neatly picked out the Newfoundland stone to score two. Gushue, who won the 2006 Olympic gold medal but has yet to win the Brier in nine previous appearances, drew for a single in the second but lost the hammer and that proved beneficial to Jacobs the next end. Back-to-back-to-back great draw shots by the skips left Gushue shot rock until Jacobs deftly picked it out with his final stone to count two. 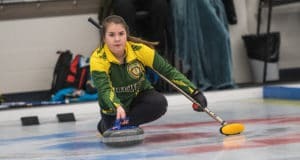 Newfoundland-Labrador had to settle for another single in the fourth after third Brett Gallant twice got only the front end of double attempts. Again, Northern Ontario jumped at the advantage of hammer in the fifth. Facing four Northern Ontario stones, Gushue made a double to reduce the damage, leaving Jacobs an easy draw for another two and a 4-2 lead at the break. That pattern continued as Jacobs continued to control the match with pinpoint hits and excellent draws. In the seventh, three nearly perfect picks – two by Fry and one by Jacobs – and a runback kill by Jacobs forced Gushue to make a tough draw for a single, again giving Jacobs the hammer. The teams traded singles in the eighth and ninth as Northern Ontario simply didn’t give Newfoundland-Labrador the chance to create an opportunity for either a steal or a pair until the 10th. Stoughton, with his team of third Jon Mead, Carruthers, Nichols, alternate Garth Smith and coach Rob Meakin, advanced to the final with 7-6 win over Howard’s Ontario foursome in the Page one-two game earlier in the day. Howard had a chance to win the game in the 10th. But his last-rock double attempt — what he considered a straightforward shot for the win — rubbed his own guard and left Stoughton an open house to draw for three and the victory. 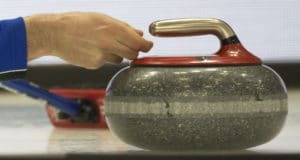 The defending Brier champion said he had no doubt it was the right shot, although he had other options to take out one Manitoba stone, give up the deuce and go to an extra end with the hammer. For live scoring and stats, go to www.curling.ca.